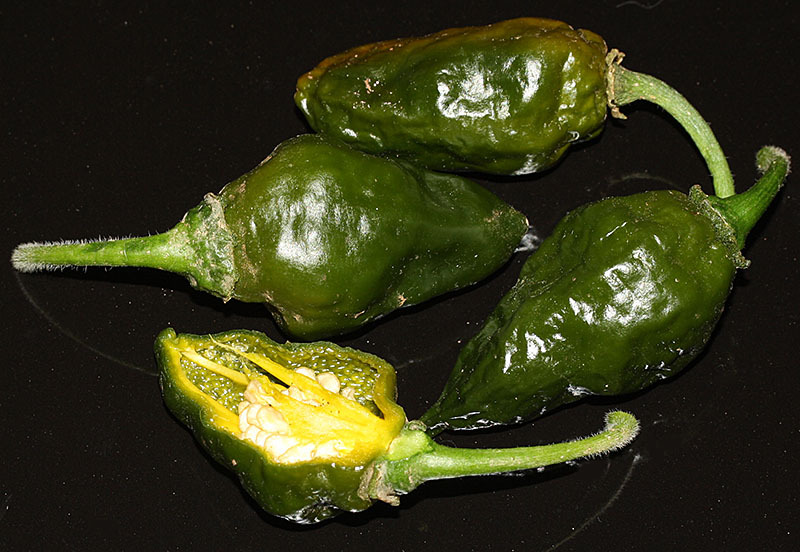 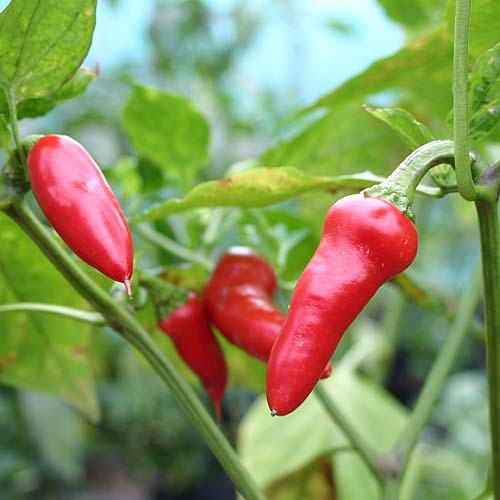 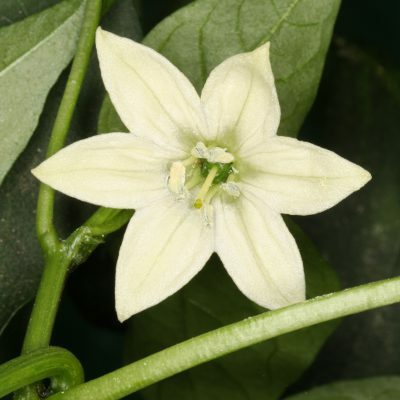 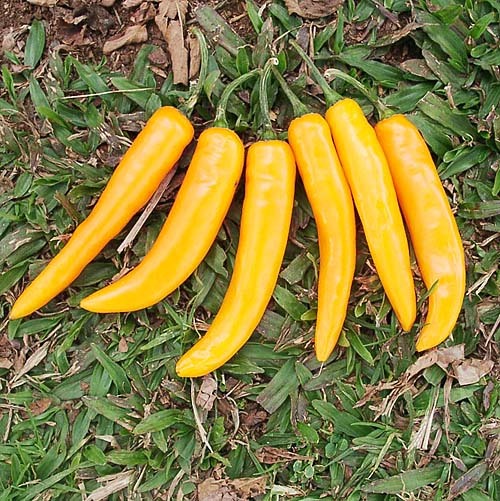 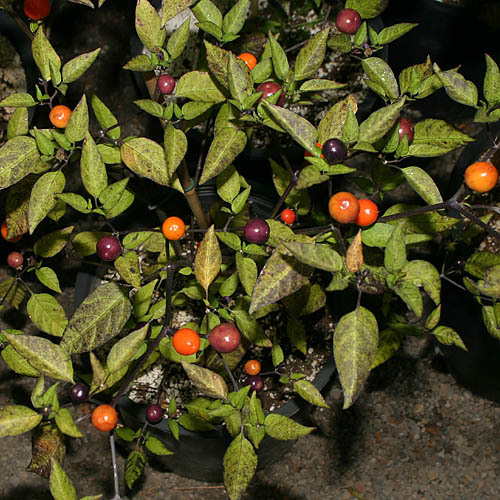 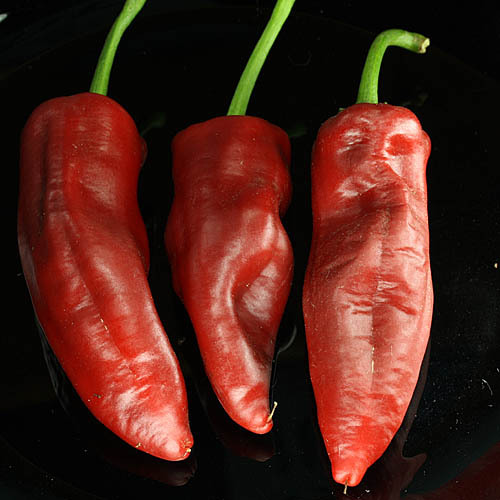 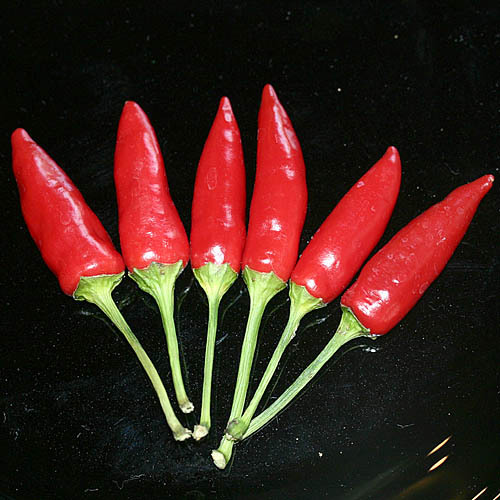 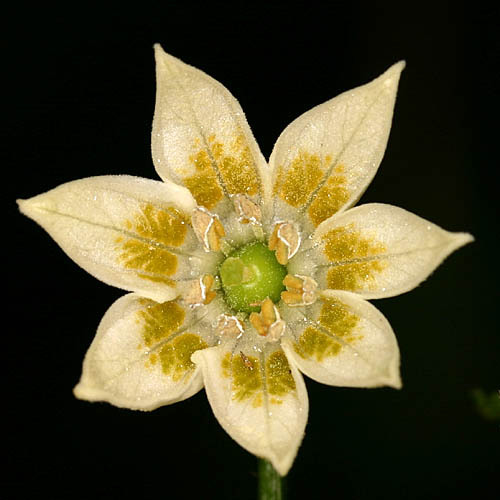 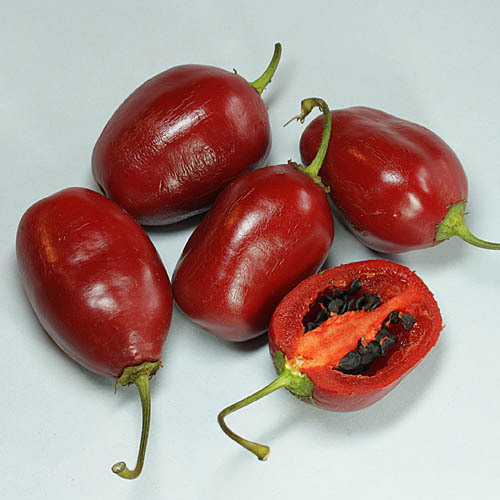 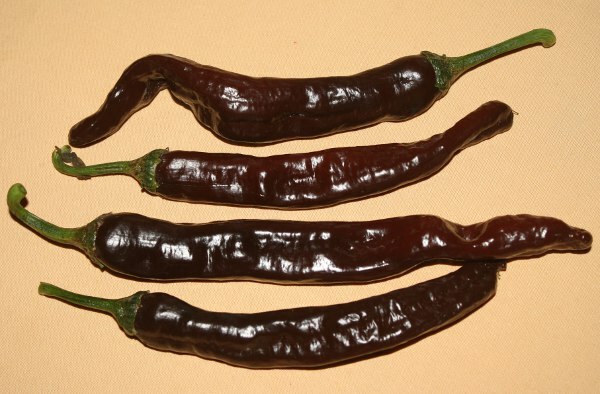 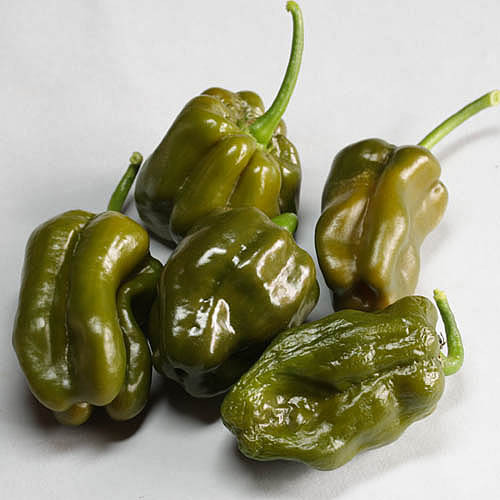 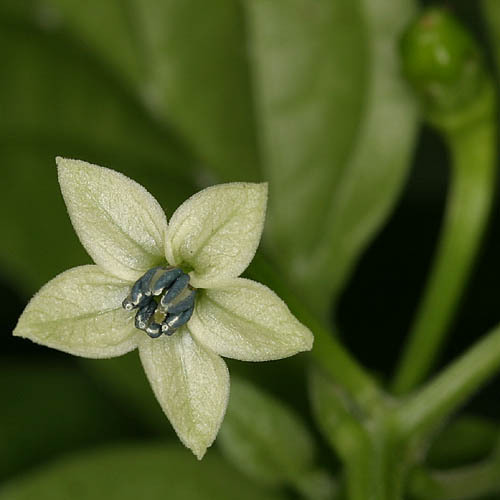 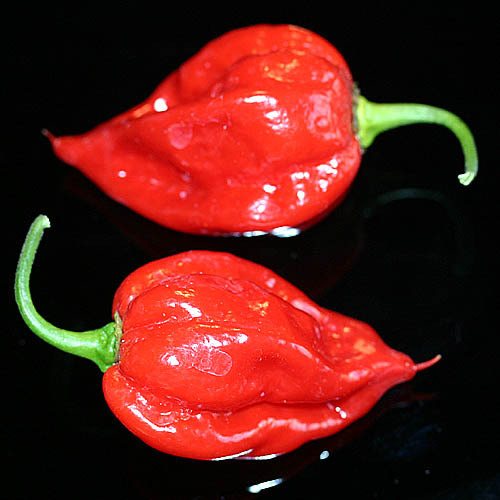 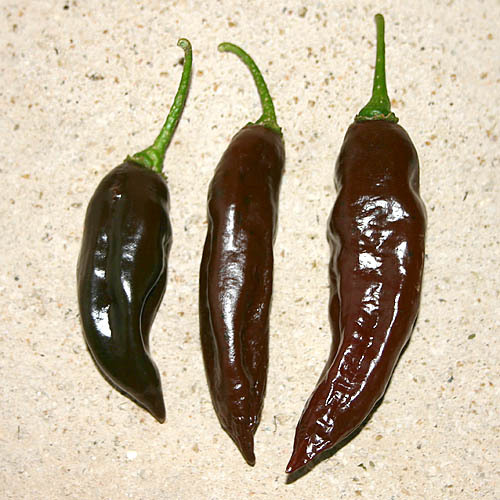 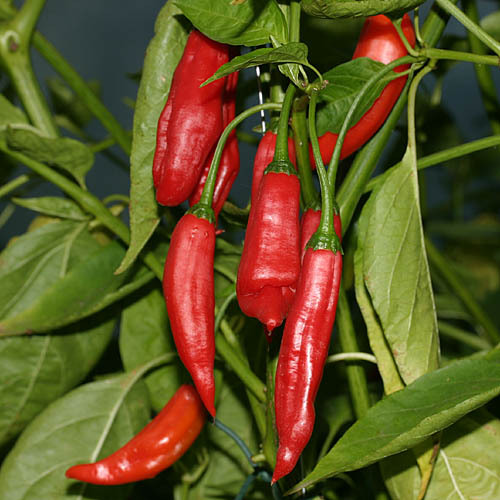 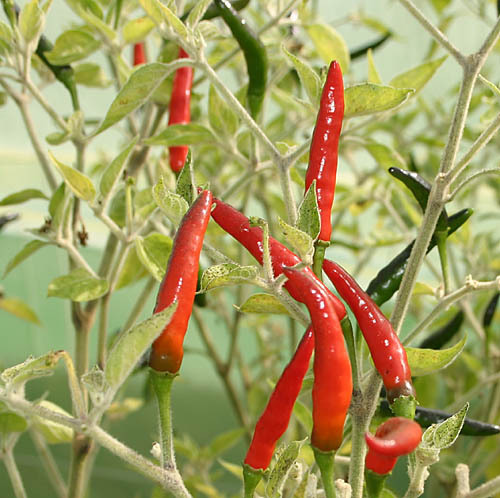 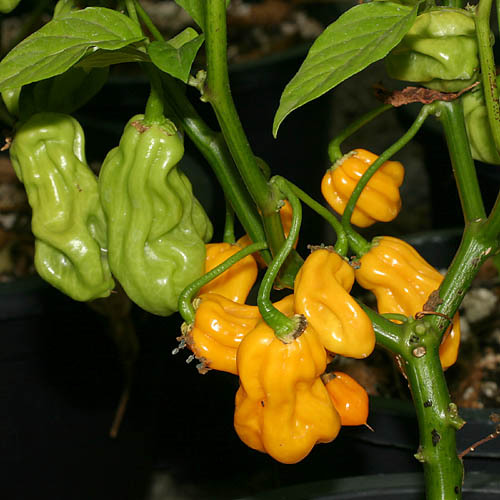 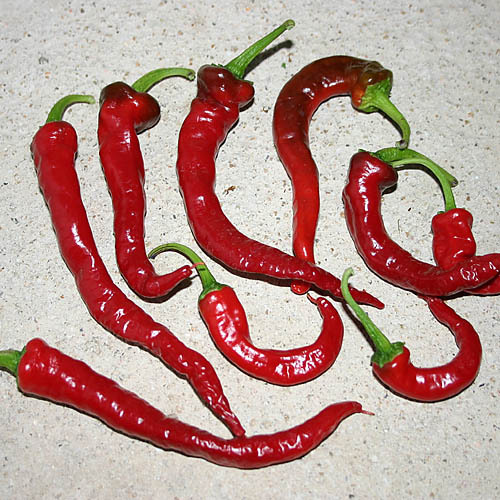 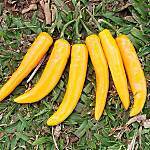 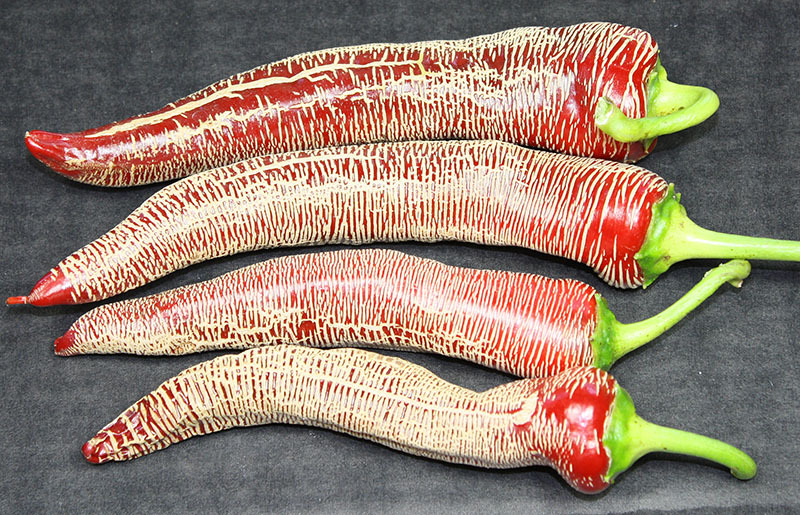 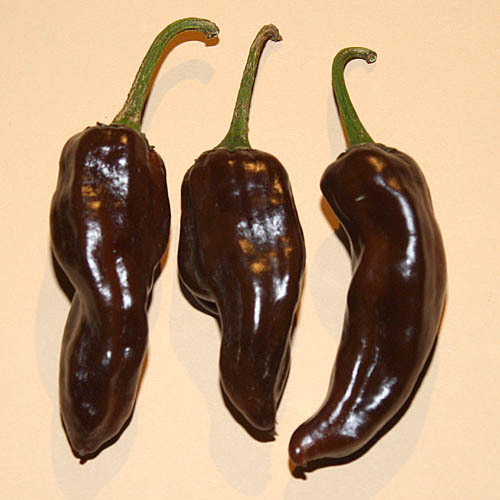 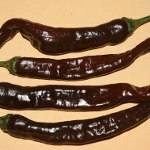 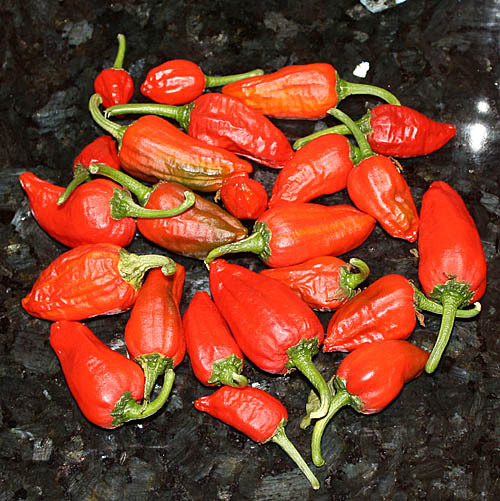 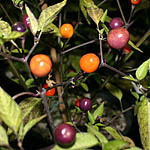 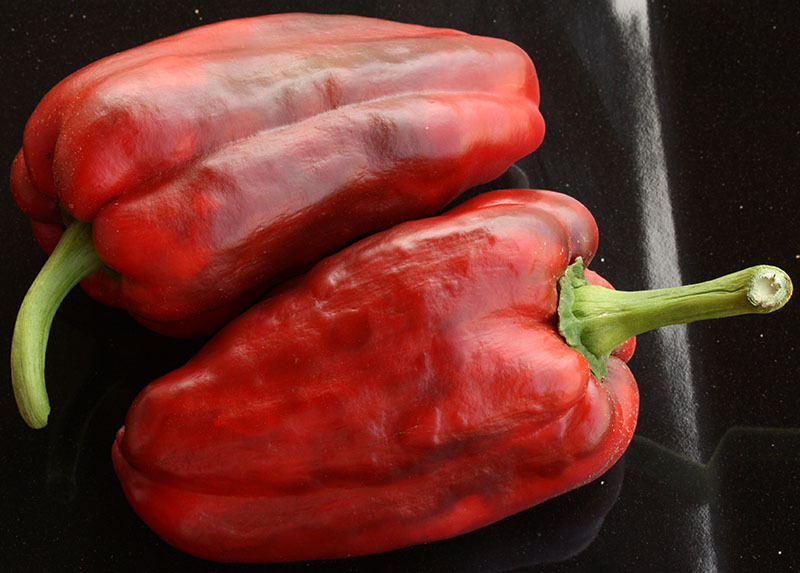 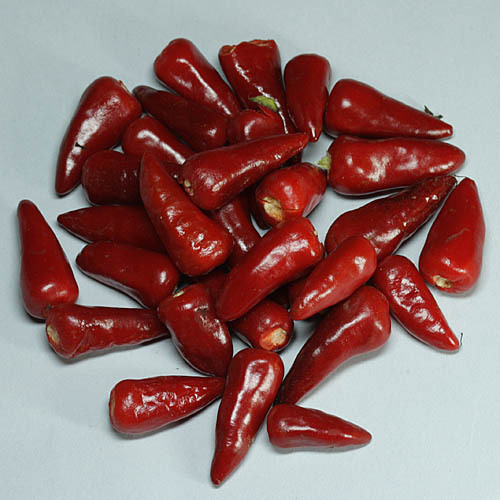 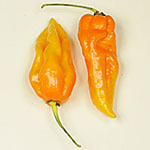 Dedo de Moca Medium hot Aji (Capsicum baccatum v. pendulum) from Brazil. 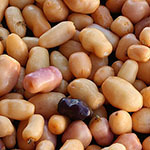 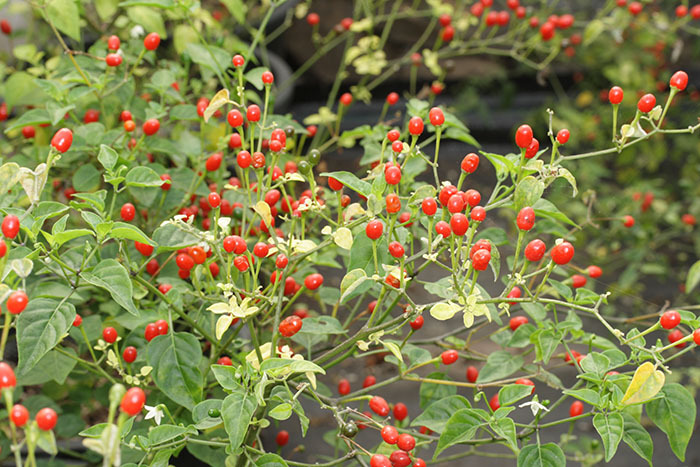 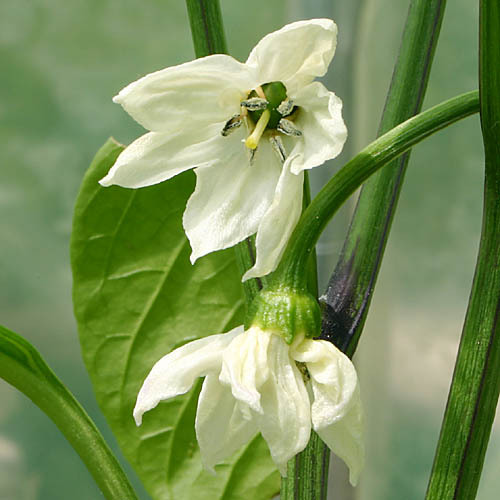 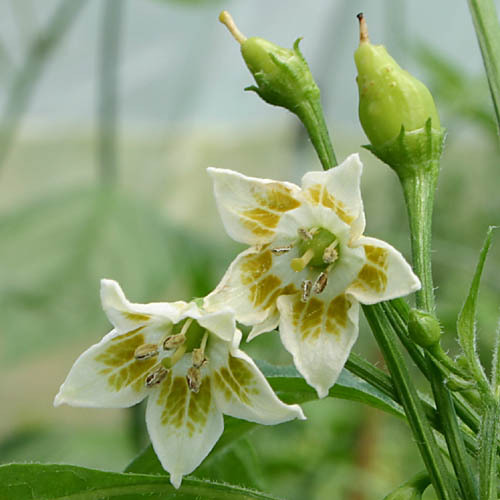 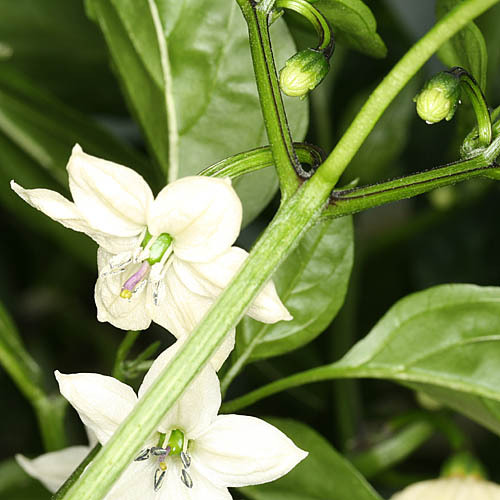 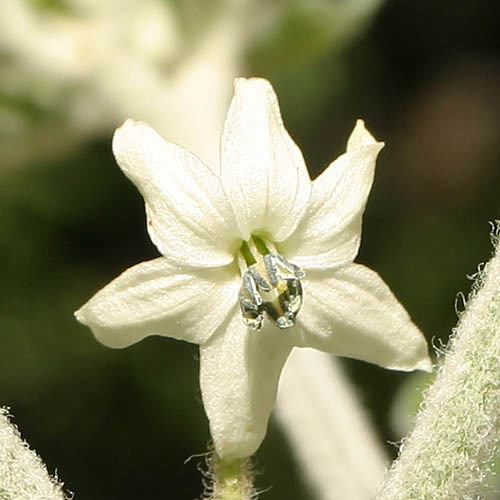 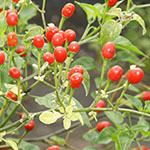 Prolific, tall plants give high yields of hot, about 10cm long pods. 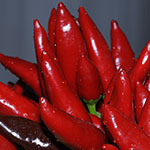 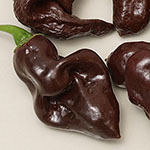 Devil´s Tongue Chocolate Very hot brown variety of Devils Tongue. 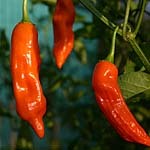 The fast growing plants have very good yields of large pods. 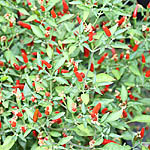 Dong Xuan Market Very prolific, medium hot Capsicum baccatum variety from Vietnam. 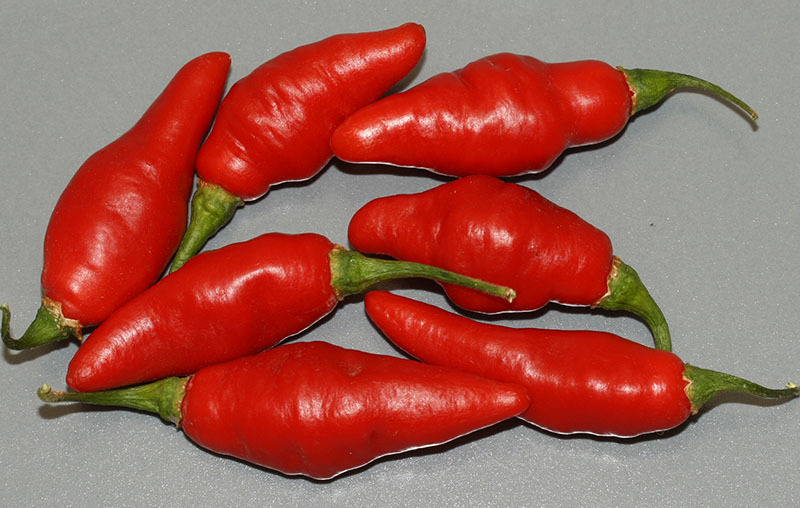 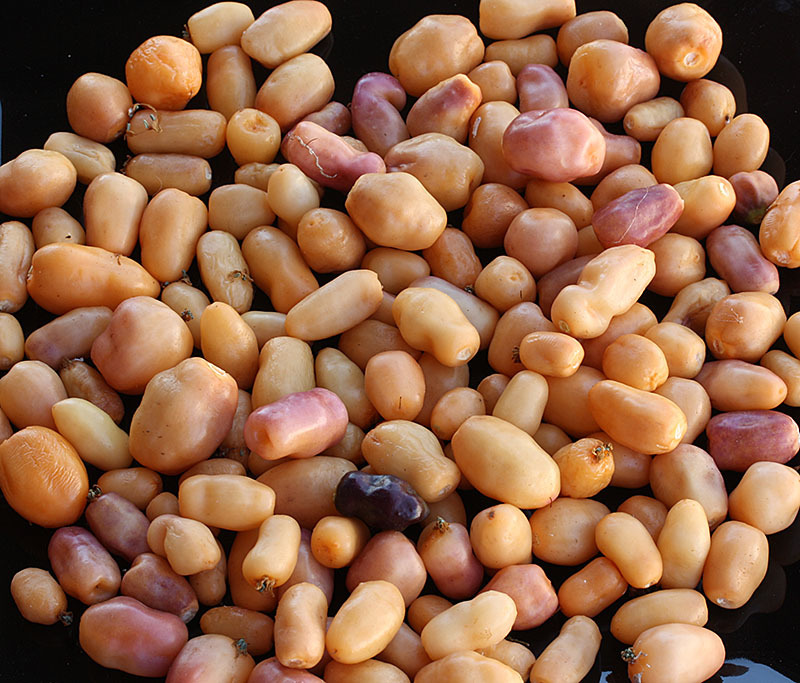 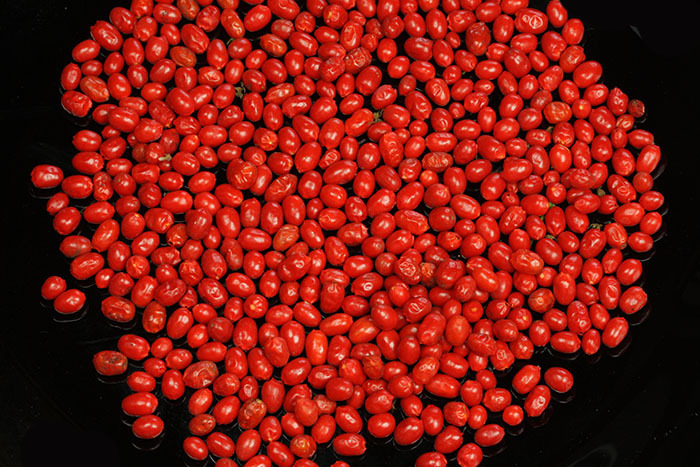 This local variety was detected at a market of Dong Xuan. 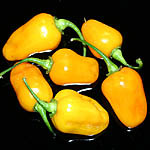 Dulce de España Very interesting sweet pepper from Spain (Capsicum annuum). 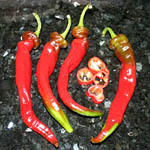 Pods have no heat, are sweet and have a very good taste. 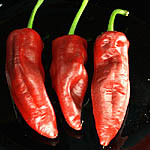 Elephant (Elefant) Medium hot local variety from Kosovo. 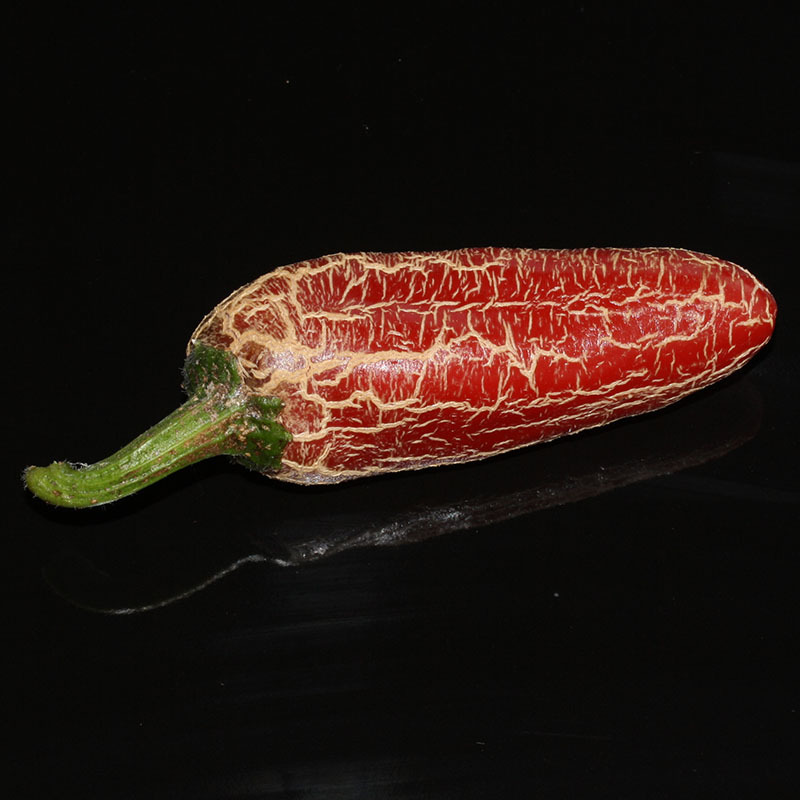 Fruits show a strage texture, thick brick red flesh. Elephant´s Trunk Capsicum annuum variety from Hungary with very long pods. 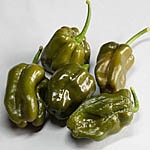 Peppers have medium to low heat and are pickled in the immature (green) state are when fully ripe in salads or at the barbecue. 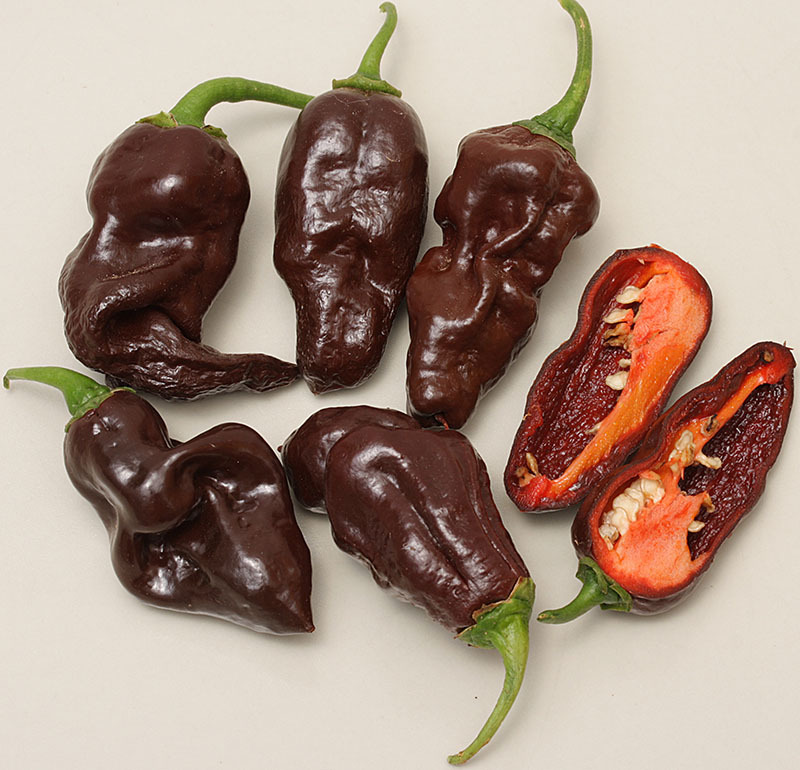 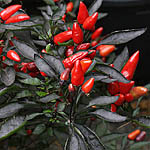 Explosive Ember One of the nicest ornamental peppers with edible medium hot pods that ripen from violett-black to dark red. 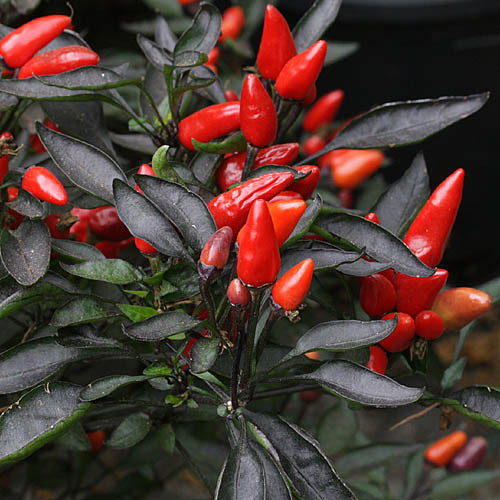 Dwarf plants with nearly black branches ans leaves are very productive. 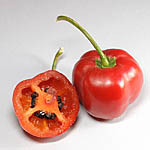 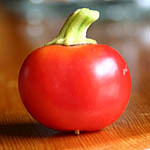 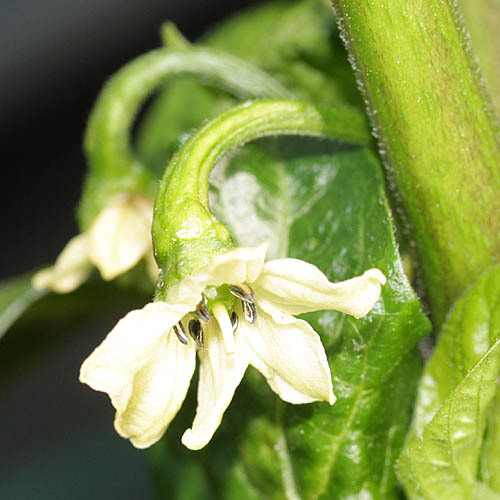 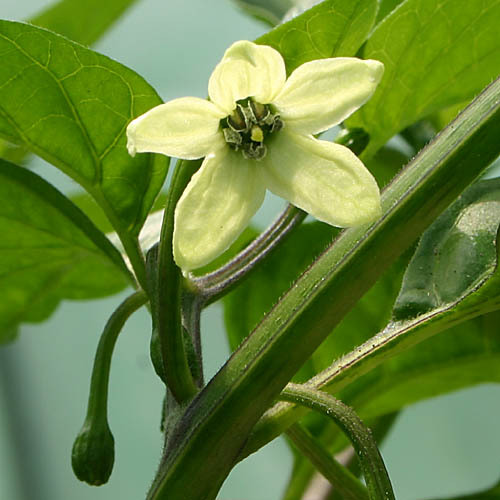 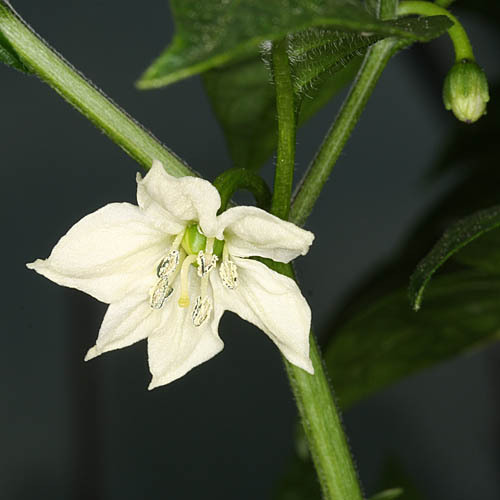 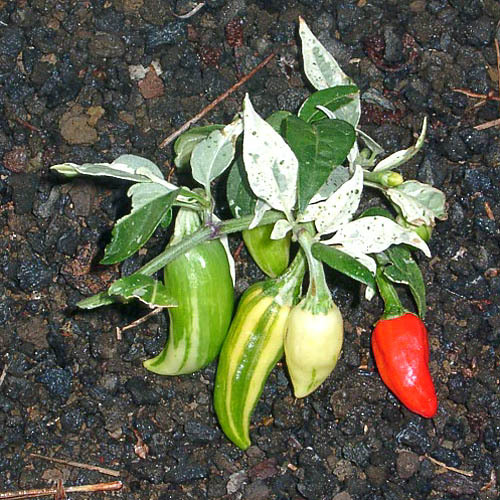 Foodarama Scotch Bonnet This variety has been discovered by Beth Boyd in a supermarket in Texas. 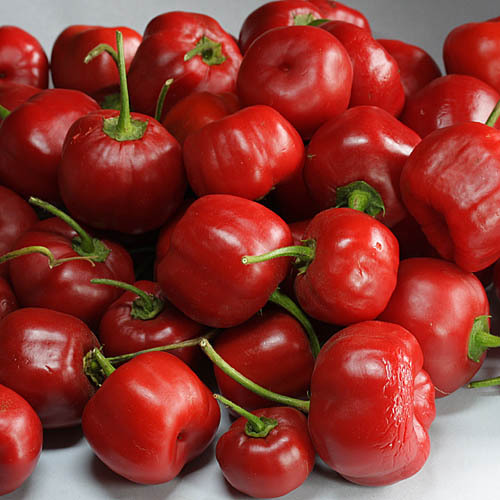 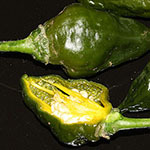 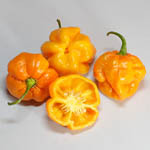 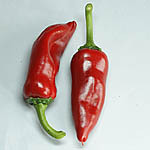 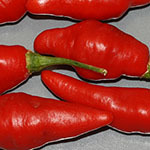 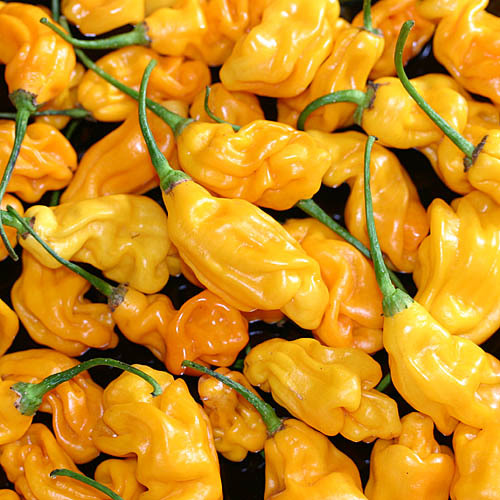 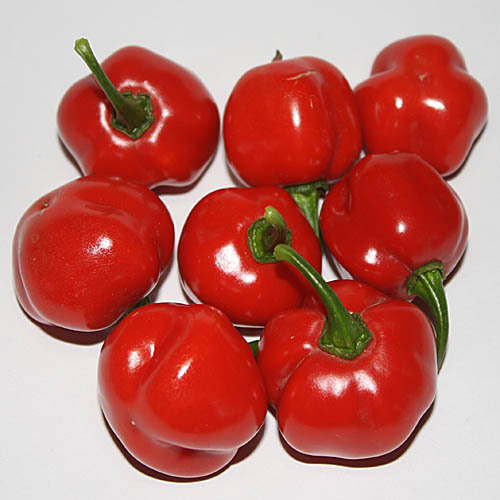 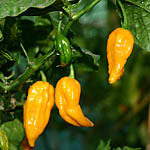 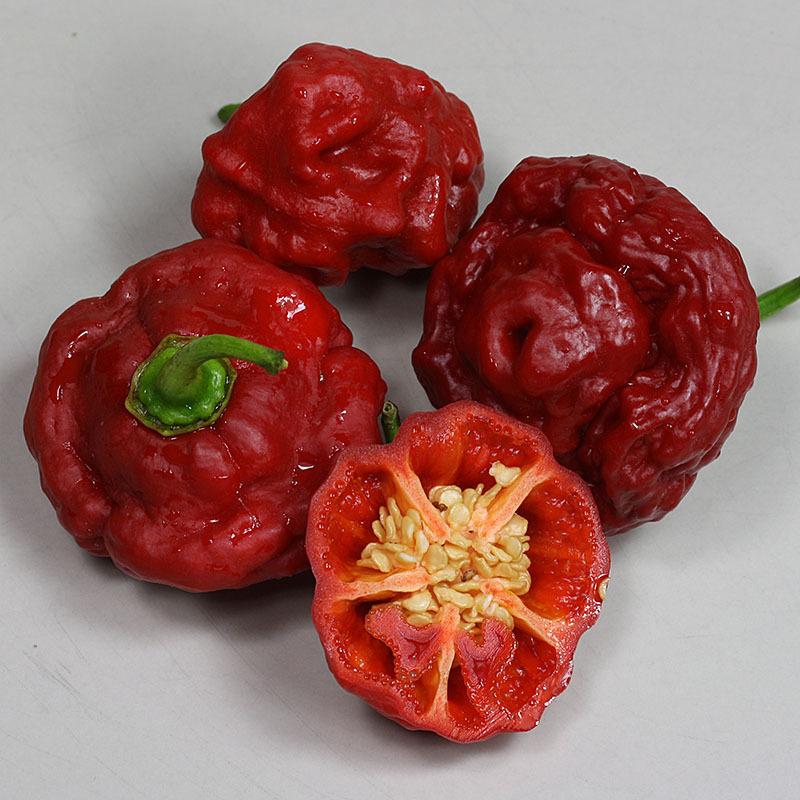 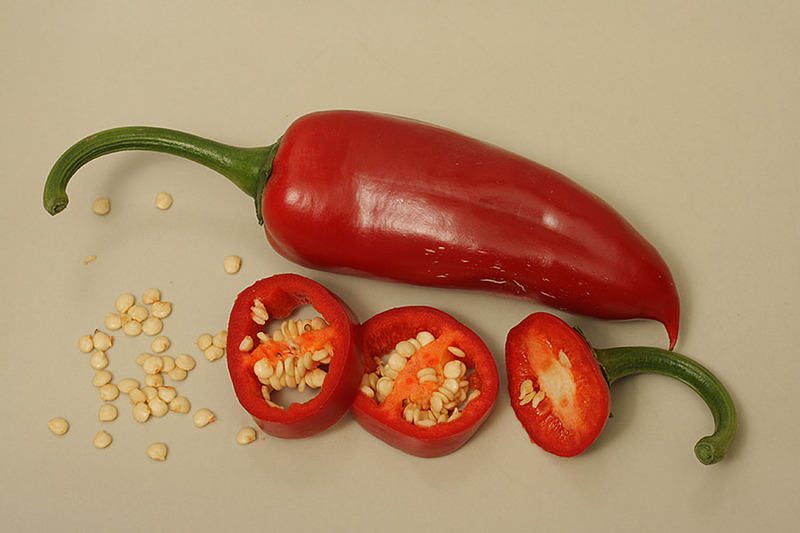 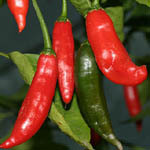 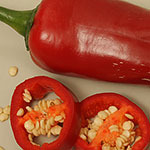 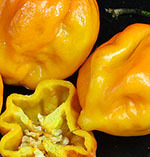 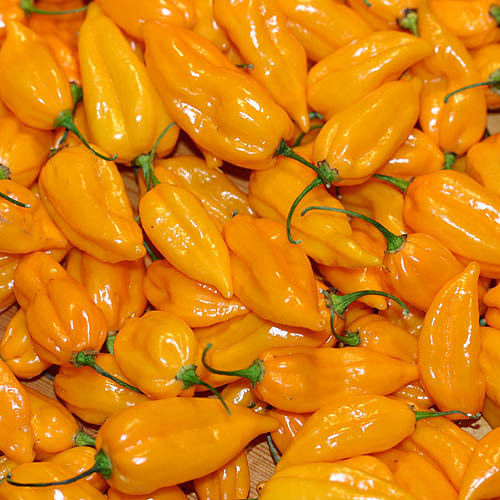 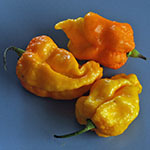 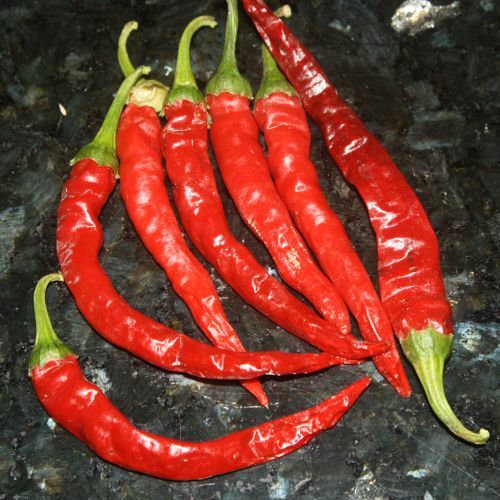 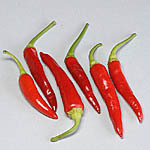 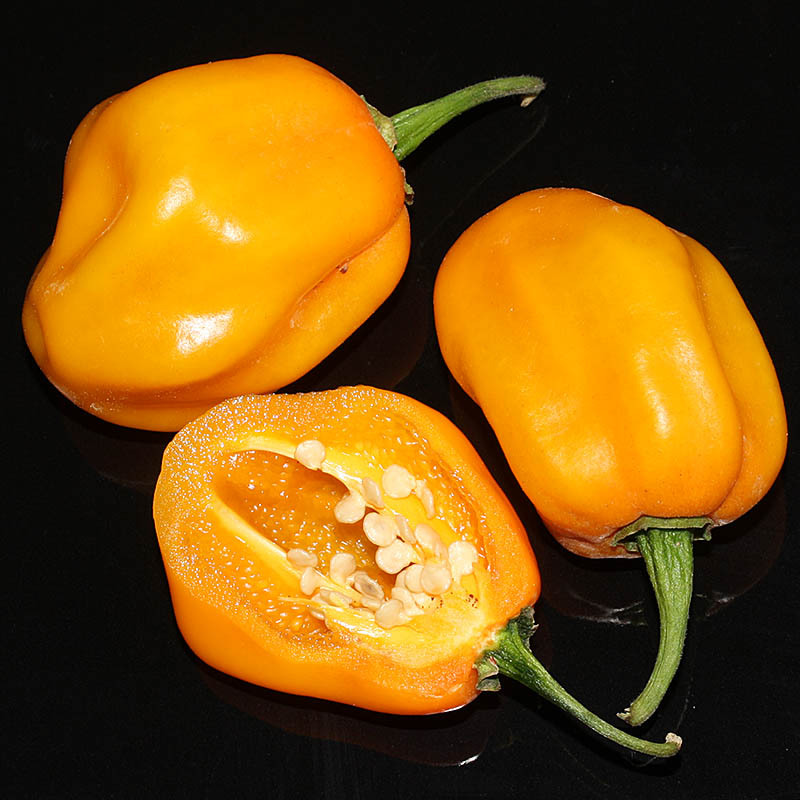 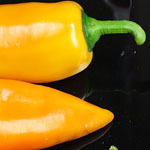 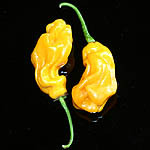 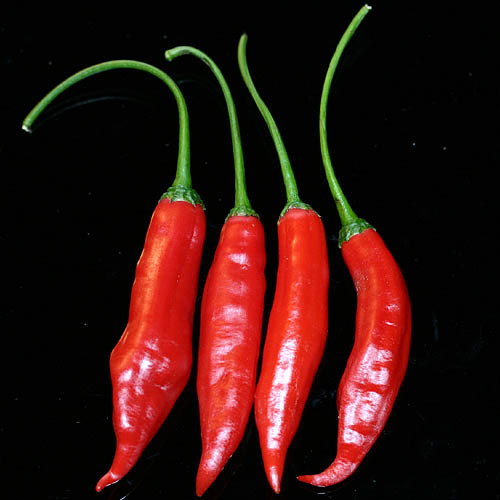 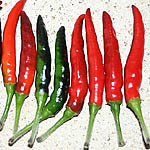 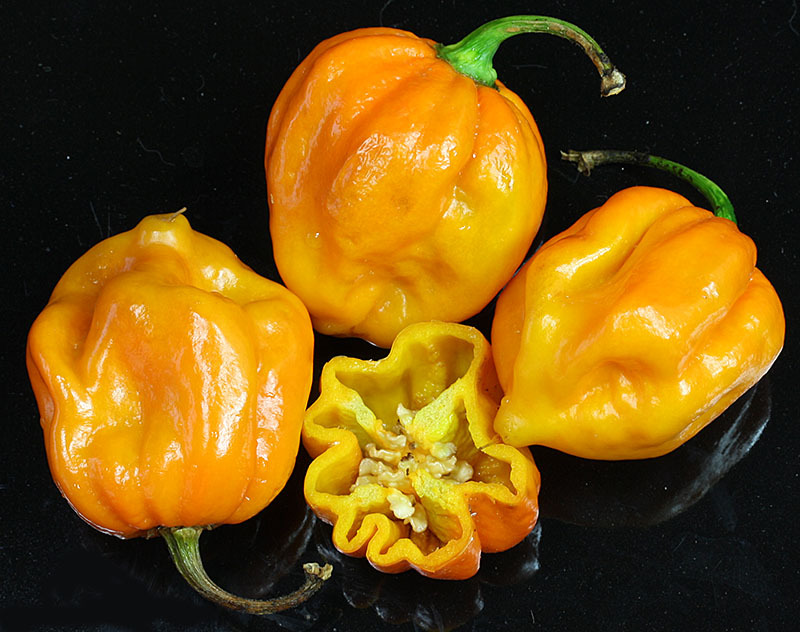 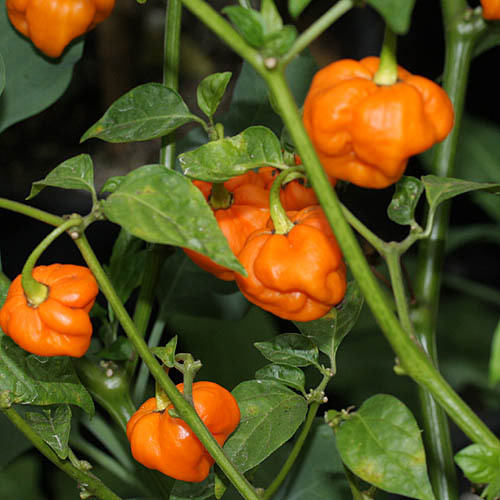 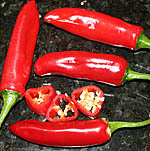 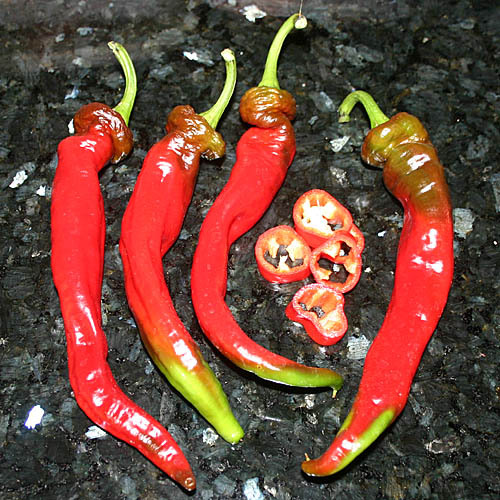 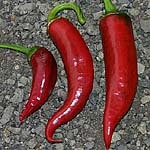 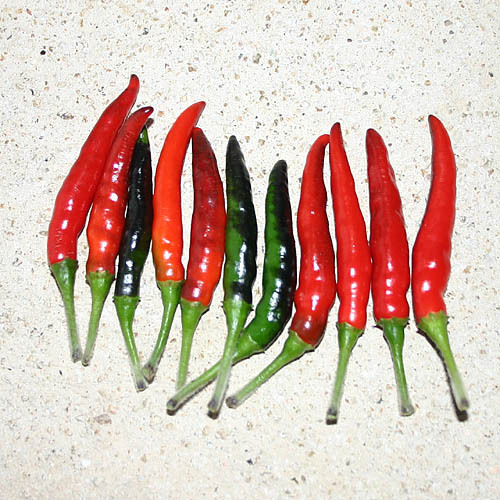 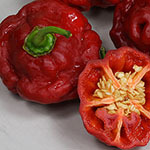 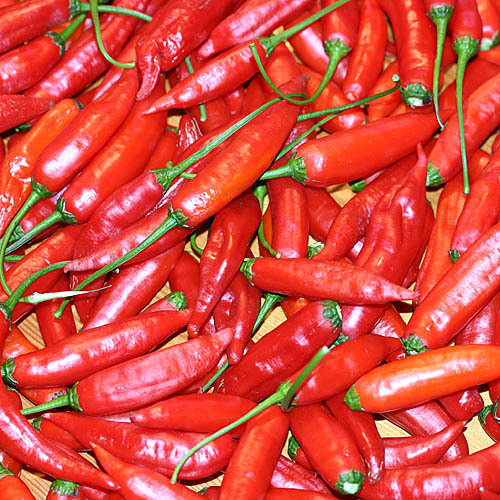 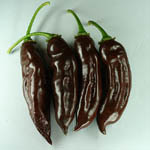 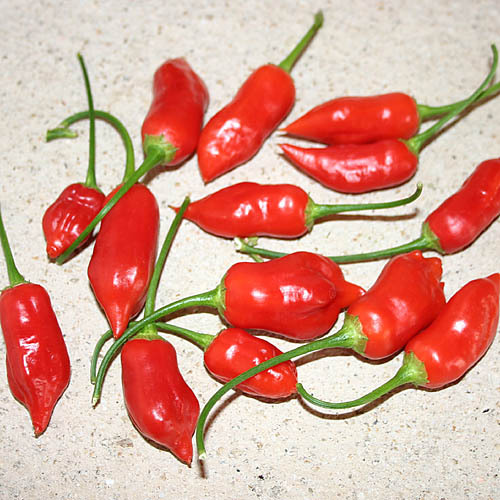 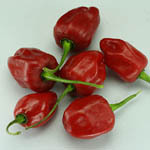 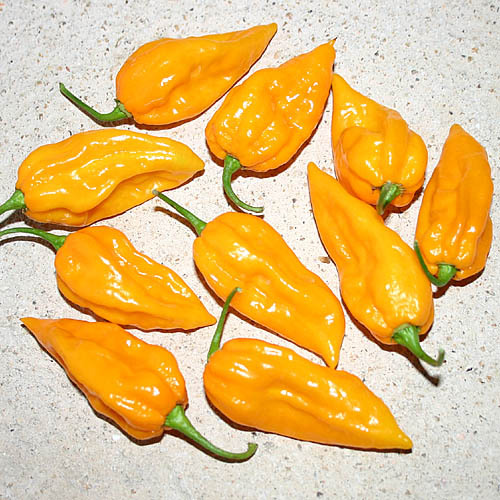 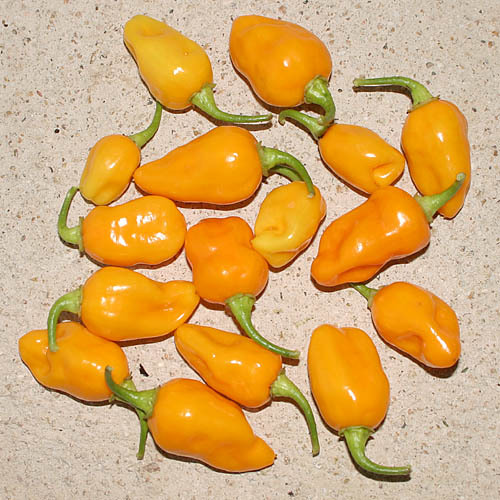 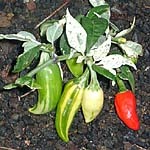 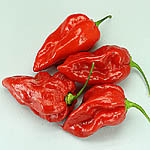 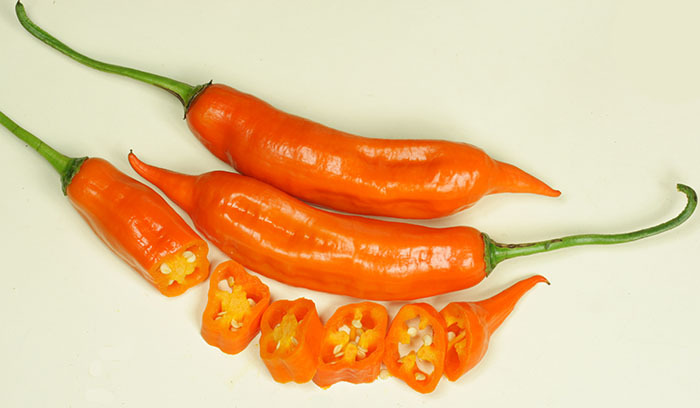 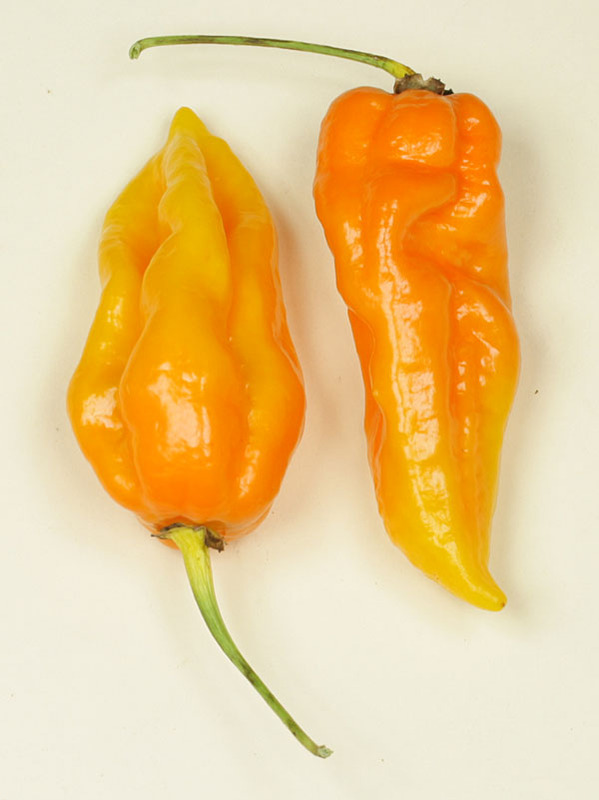 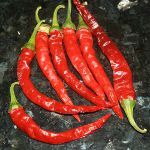 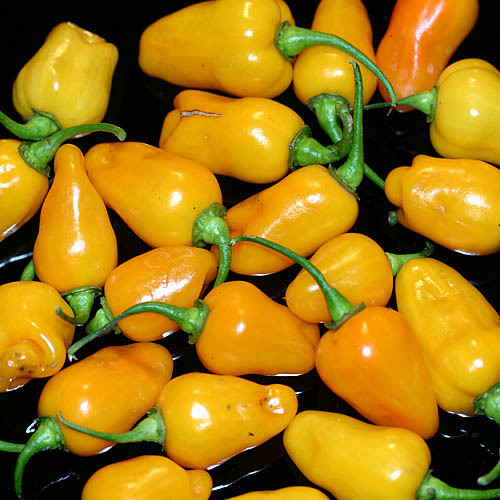 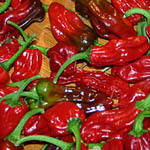 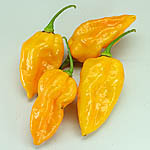 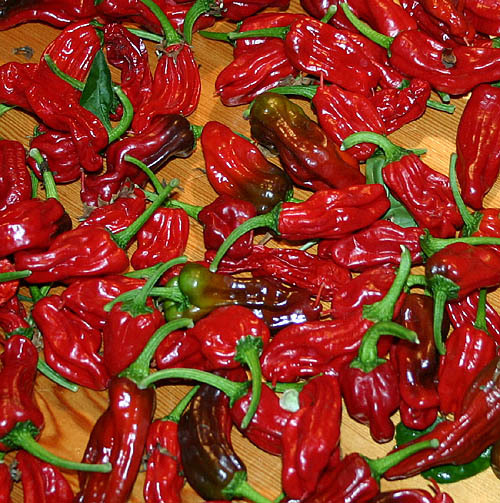 Provides everything you might expect from a good Scotch Bonnet: Early, high yields, good taste and a good Chinese heat. 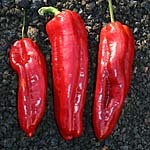 Francos Aji My friend Franco has grown this variety for years in his garden, but doesn´t remember whre he got it from. 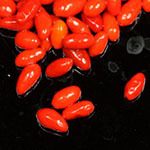 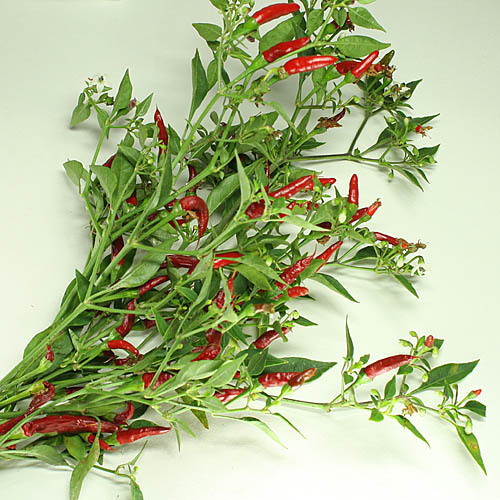 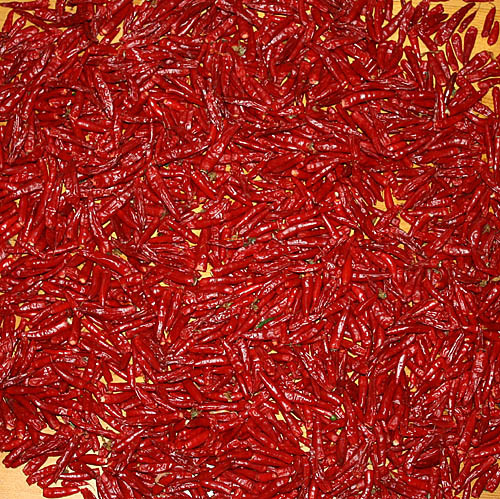 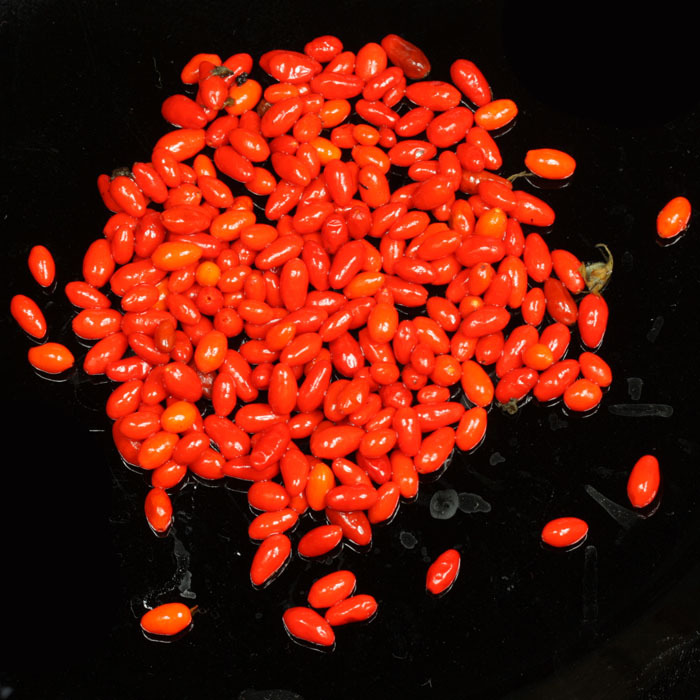 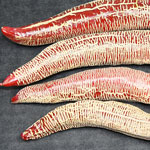 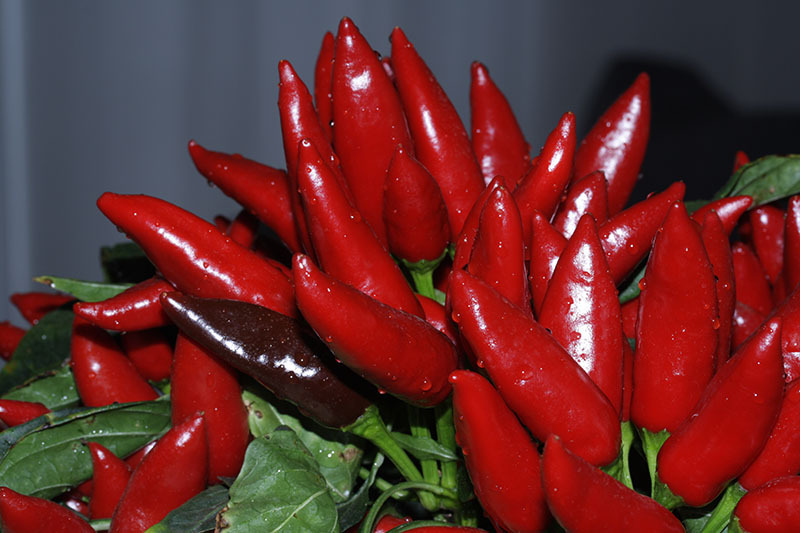 Very large plants carry large red pods that show only a slight heat. 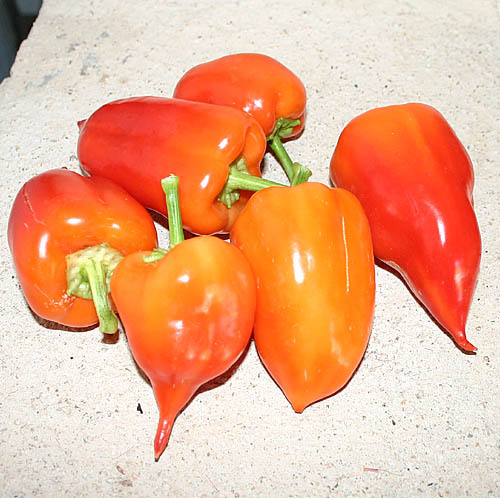 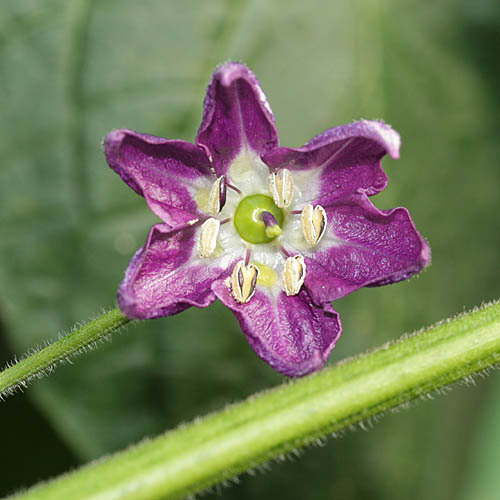 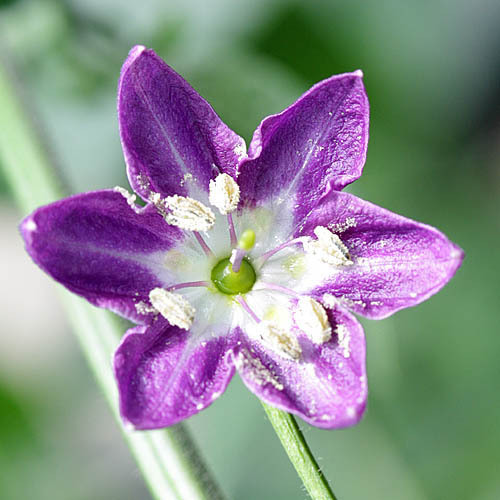 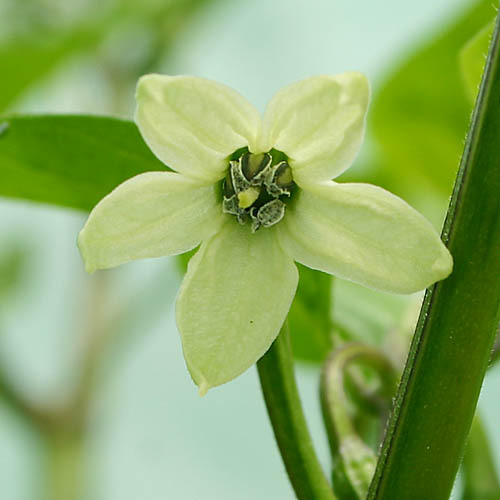 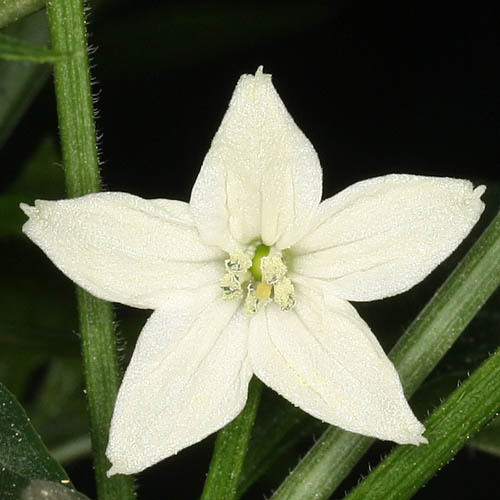 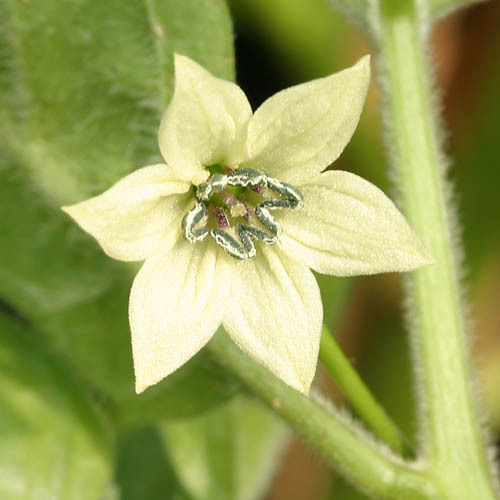 (Capsicum baccatum). 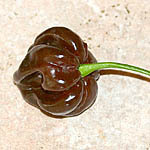 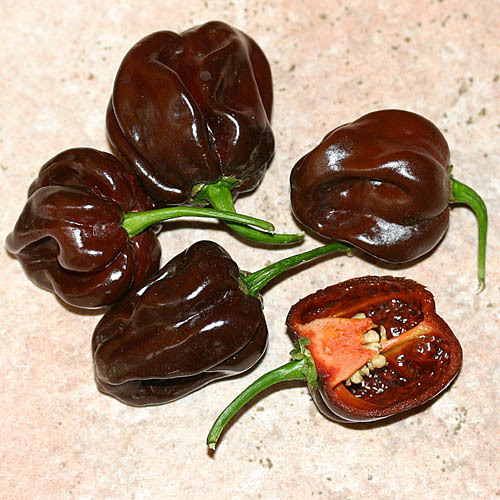 Guadalupe Black Very hot Scotch Bonnet variety from Guadalupe. 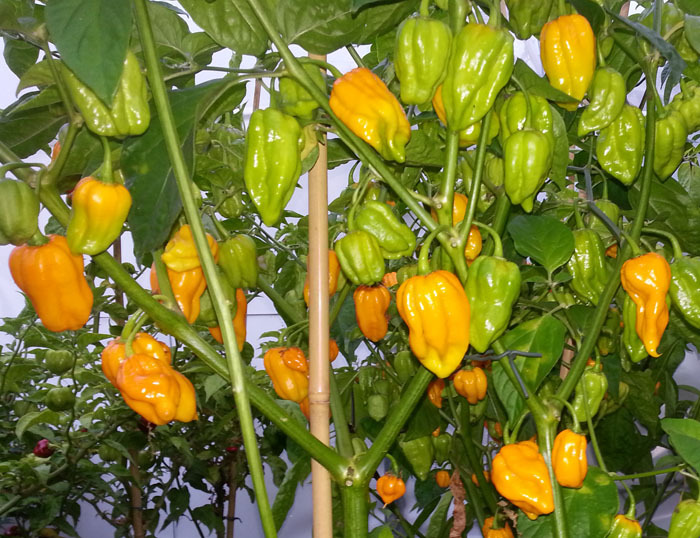 Good yields of tasty pods. 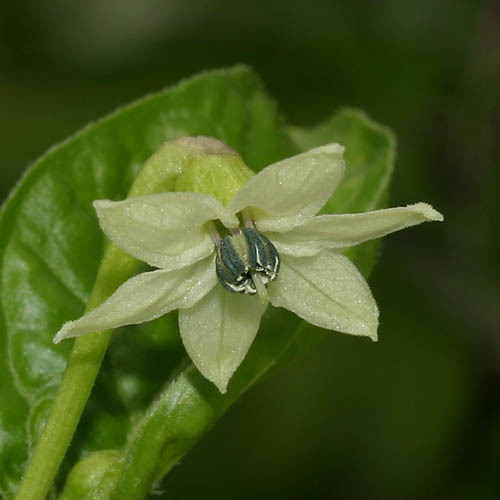 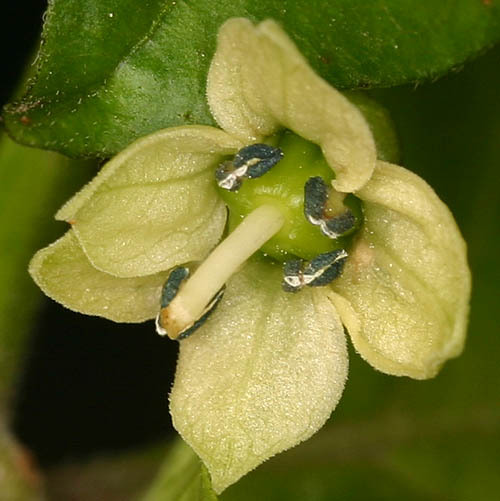 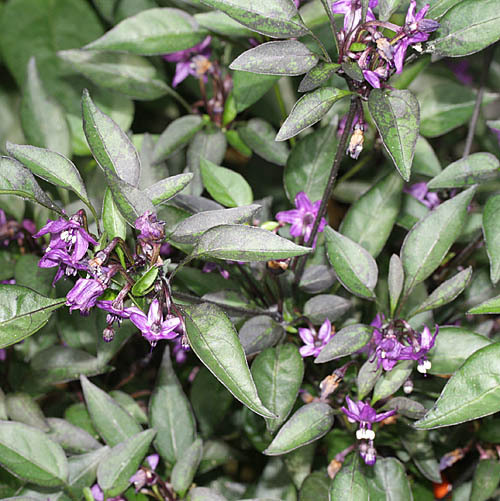 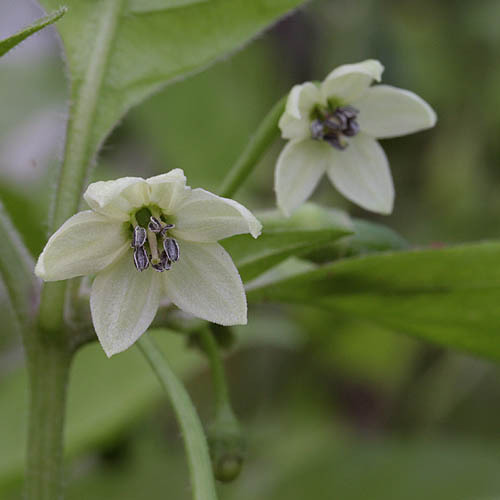 Capaicum chinense.